The Grand Trunk Railroad ran a ferry service for railcars across Lake Michigan from Grand Haven (later Muskegon) to Milwaukee. The Grand Trunk Railroad entered into the car ferry business after seeing the success of the Pere Marquette and Ann Arbor ferries. The Detroit & Milwaukee Railroad, a predecessor to the Grand Trunk Railroad, reached Grand Rapids, Michigan in 1858 and break-bulk service began out of Grand Haven to Milwaukee. This arrangement continued in part until 1903 when the ferry Grand Haven entered into service. The year 1908 saw the SS Milwaukee join the Grand Trunk fleet. The SS Milwaukee was not built for the Grand Trunk, but had been renamed after the Grand Trunk acquired the Manistique Marquette and Northern I. The SS Milwaukee and Grand Haven served alone until the 1920’s. Occasionally ferries from the Pere Marquette and Ann Arbor were leased when necessary to supplement the busy fleet. In 1926 the Grand Rapids joined the fleet followed a year later by the Madison. The Madison had the honor of being christened with milk, in honor of Wisconsin’s dairy history. The Wisconsin-Michigan transportation company bought a civil suit against the Grand Trunk in 1927. 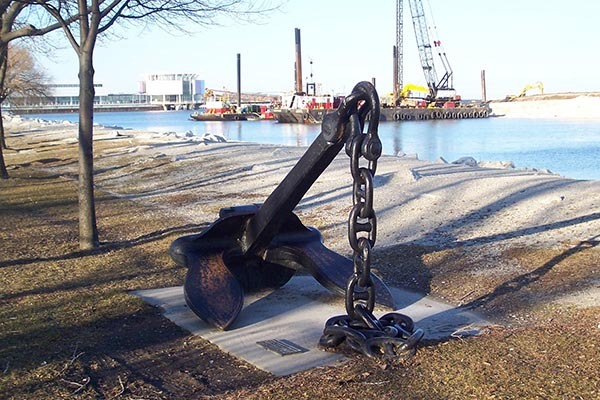 The suit alleged that since the Grand Trunk was owned by Canadian National Railroad that the Grand Trunk was in violation of the Merchant Marine act of 1920. The act forbade the use of vessels that were more than 25% foreign owned from transferring items that originated in one American port to another American port. The Grand Trunk fought back and eventually it was determined that the freight neither originated in Grand Haven or Milwaukee so they were in compliance with the act. Ferry service resumed but not before Grand Trunk had entertained the Pennsylvania Railroad into buying a 75% ownership of the ferry system to ensure compliance with the act. The Pennsylvania decided that Grand Haven was a lousy port for ferry operation and asked permission to switch the ferry routes from Grand Haven-Milwaukee to Muskegon-Manitowoc. The Ann Arbor protested the attempt by the Pennsylvania to change the route to Manitowoc and under pressure the route was changed to Muskegon-Milwaukee. In 1933 the last regular ferry left Grand Haven and all future operations were from Muskegon. The slips at Grand Haven were maintained for emergency use only. On October 22, 1929 a strong northeast gale struck Lake Michigan. All Pere Marquette and Ann Arbor ferries stayed in port. All the Grand Trunk ferries departed for their normal routes. The Grand Haven made the round trip to Milwaukee and back to Grand Haven in fifteen hours, a trip that would normally take six hours. The SS Milwaukee left Grand Haven and made it to Milwaukee in normal fashion. In Milwaukee she took on a load of 26 railcars and headed back to Grand Haven. As she left the harbor she was seen pitching and rolling heavily. No one knows what exactly happened next as there were no survivors. Five days after the SS Milwaukee sank a Coast Guard patrolman found the ship’s message bottle floating near an empty lifeboat close to South Haven, Michigan. The message was from the ship’s purser, A.R. Sadon and said, “The ship is taking water fast. We have turned around and headed for Milwaukee. Pumps are working but sea gate is bent and can’t keep the water out. Flicker (crew quarters) is flooded. Seas are tremendous. Things look bad. Crew roll is about the same as last pay day.” The number of men lost was estimated to be between 46 and 53. Only 21 of the bodies were recovered. In April 1972 the wreck of the SS Milwaukee was located seven miles northeast of Milwaukee and three miles offshore. Immediately after the sinking of the SS Milwaukee the Grand Trunk ordered a new ferry. The City of Milwaukee entered service in 1930 just in time for the great depression. During the height of the depression only two of the Grand Trunk ferries would regularly see service. The Grand Haven was essentially put in mothballs in 1931 and in 1946 she was sold to the West India Fruit & Steamship Company where she saw service as a Havana-Florida car ferry. In 1953 the Pennsylvania Railroad withdrew from the ferry business and the Grand Trunk became sole owner again. Ferries continued to run from Muskegon until 1978 when the City Of Milwaukee was sold to the Ann Arbor. The Ann Arbor sailed the City of Milwaukee until 1982 and then she was permanently retired. Today the City of Milwaukee is a national historic landmark and resides in Manistee, Michigan where she serves as a tourist attraction.